Disneyland is a mystical place any time of day, but the magic at sunset is particularly remarkable. Although you’ll see some pretty spectacular views no matter where you go in the park, watching the landscape transform just before twilight is extra special. Because Southern California is beautiful and sunny all year long, Disney consistently has some of the best sunsets in the country. 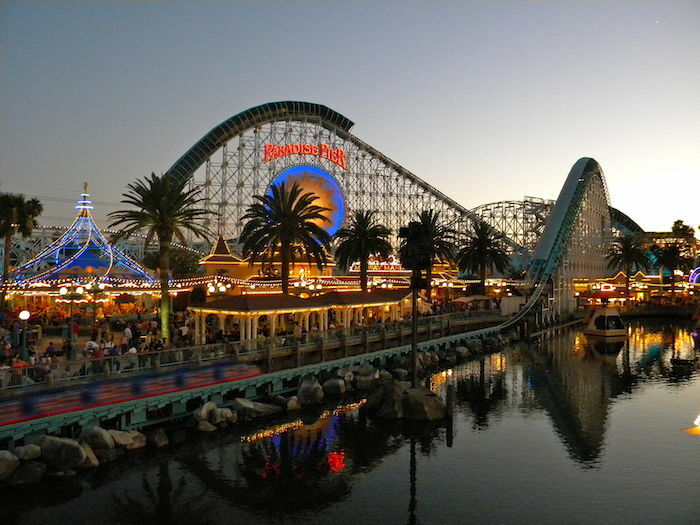 Why are Disneyland Sunsets so Exceptional? At Disneyland, you can completely immerse yourself in the fairy tale. The entire park is a feast for your senses, and adding the vibrant backdrop of a gorgeous sunset enhances the experience. You’ll feel all the typical happiness triggers of the nostalgic music and distinct scents, but the extraordinary evening views heighten the sensations and emotion. It’s no secret that Disneyland is iconic. This is because cast members provide special touches and make everything feel just right for both children and adults. The variation of themes, rides, storytelling, stage performances and engaging attractions also add to the park’s prestige. When you experience these elements at sundown, it almost creates a mystery to the very recognizable features of Disney. Where are the Best Areas for Viewing a Sunset? Nearly any point is great for watching the sun glow softer. Countless silhouettes boost the pretty factor, from the Mouse himself to the towering palm trees. For an even more memorable treat, hop on one of the outdoor rides at dusk. The Mark Twain Riverboat, Storybook Land Canal Boats and Monorail provide stunning views of the sun dipping beyond the tree-lined waters. If you really want to watch the park change colors, head to the top of Tarzan’s Treehouse or any elevated attraction. It’s also impressive to see the crimson, tangerine and gold shades illuminating the cobalt sky behind Sleeping Beauty Castle. As Main Street lights up, the twinkling lights against the subdued tones of nightfall is hypnotizing. What are Some Other Unique Points of Interest? As the sun sets in Disneyland, the park feels more tranquil but simultaneously has a new energy. The special effects tell a different story at dusk. When the sky starts to transform, there is a mythical vibe in Downtown Disney, and Fantasyland becomes even more whimsical. If you’re lucky enough to catch a magenta sunset from Adventureland, you’ll witness an unforgettable exotic display. The most special aspect of a Disneyland sunset is the romantic, sentimental appeal. Disney is a place to relax and step away from the real world with your loved ones. Whether you’re young or young at heart, you’ll be amazed at how the setting sun paints this storybook land with even more magic and splendor. If your photos are posted on this blog post it is because your images have caught our eye, we love all of them! Thank you so much for giving us permission to share your photos and for letting others enjoy and experience your adventure!